Just because the days are getting warmer and longer that doesn't mean we need to turn our backs on cozy spaces. More than any other room in the house, your bedroom should provide a welcome respite from the rest of the world and be a space you relish. Check out these 11 cozy bedroom ideas for proof that comfy spaces are always in season. 1. Add wood beams to lofty ceilings. 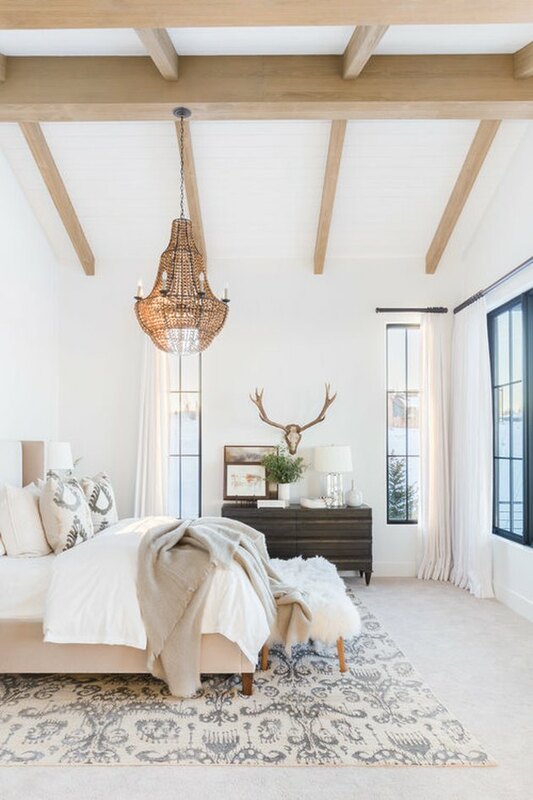 Located in Park City, Utah, the Mountain Ranch project by Nicole Davis incorporates just the right amount of rustic touches (wall-mounted antlers and fur bench, anyone?) while avoiding any cabin kitsch. Light-wood exposed beams and an oversize wood-beaded chandelier add warmth to the muted color palette. And a fluffy bed and layered carpets are always a "Do" when it comes to achieving an extra-cozy feeling. credit: Jersey Ice Cream Co.
Vintage items add depth and soul to a room that just can't be achieved with something new. The team over at Jersey Ice Cream Co. captured that cozy bedroom idea beautifully in this hotel guest room. The walls add plenty of texture creating a warm and inviting space rich with character. A unique brass chandelier along with, industrial steel frame windows, and one-of-a-kind artwork create a happy and thoroughly welcoming retreat. It's not too late to actualize your childhood dreams of sleeping in a tree house. Well ... sort of. 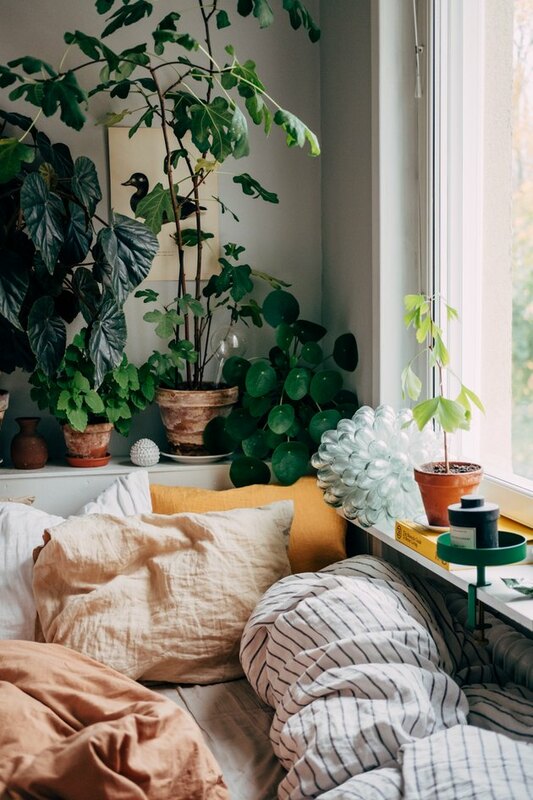 Designer and blogger Sebastian Bergström's boho-chic bed is surrounded by lush greenery, which is pretty close — only with softer linens and no bugs. Whitewashing or limewashing is a process that uses water, salt, and limestone to give walls a patina or aged look that still feels fresh and clean, but adds dimension. This cozy bedroom idea designed by Leanne Ford employs the technique flawlessly, imparting a cloud-like feeling in the space, while stone flooring creates an English cottage vibe adding character to the muted color palette. 5. Use a multitude of patterns. This one has us scratching our heads asking, "how DOES she do it?!" As far as we're concerned, Amber Lewis of Amber Interiors is the ultimate mixologist of the design variety. 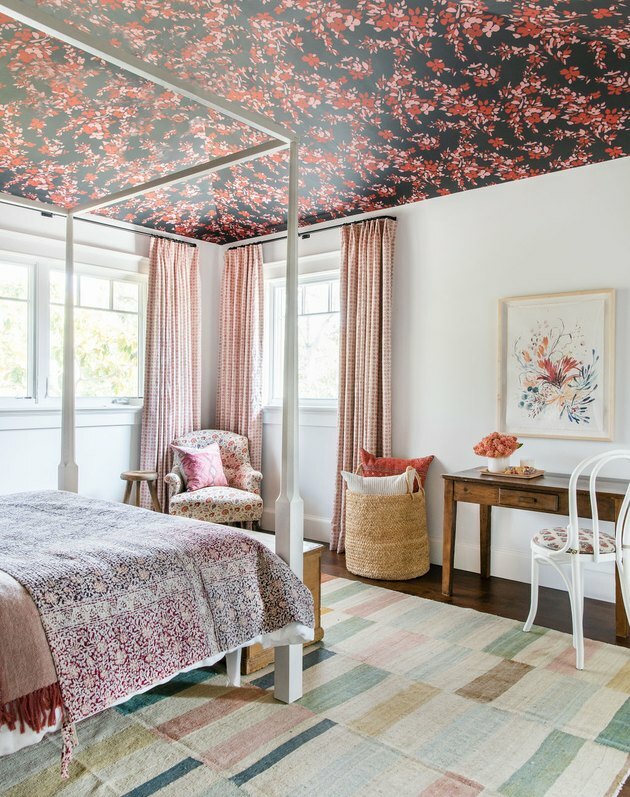 Case in point: the whimsical wallpapered ceiling, the striped rug, the drapery, the bedspread, and the chairs all work perfectly together for a warm and grown-up — but not too grown-up — kid's hideaway. 6. Don't be afraid of the dark. Dark gray, almost black, grasscloth wallpaper adds texture to this room designed by Shea from Studio McGee, and creates a wonderfully moody vibe that has us wanting to crawl into bed with a good book and stay there all day. An oversize pendant light adds visual impact and swing-arm wall sconces complement the crisp linens. 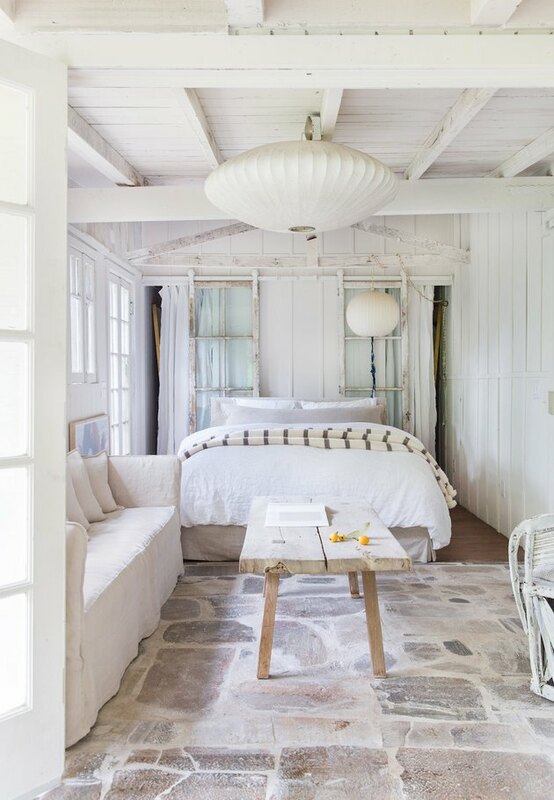 Organic elements — like the wood beams and leather bench — never fail to bring in warmth. 7. Work with what you've got. When you have an amazing view, make it the focal point of your room by framing it with oversize sliding doors, as Studio Life.Style did in this sophisticated, all-white bedroom. The neutral color scheme allows the outdoors to take center stage, while a layered mix of oversize pillows and textured blankets create the bed of our dreams. Wood furniture and a woven pendant light (just out of view) add a hint of warmth. 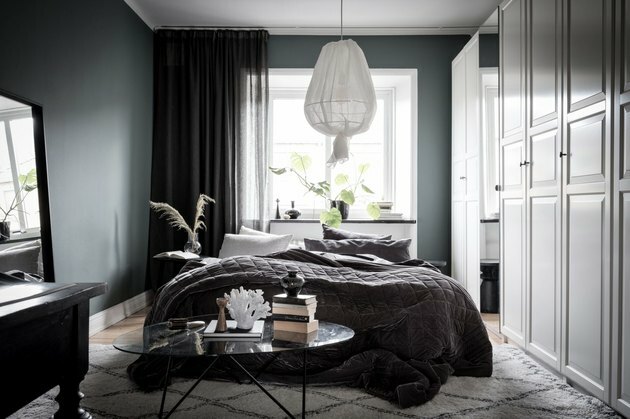 This cozy bedroom idea confirms that there really is something to color theory. 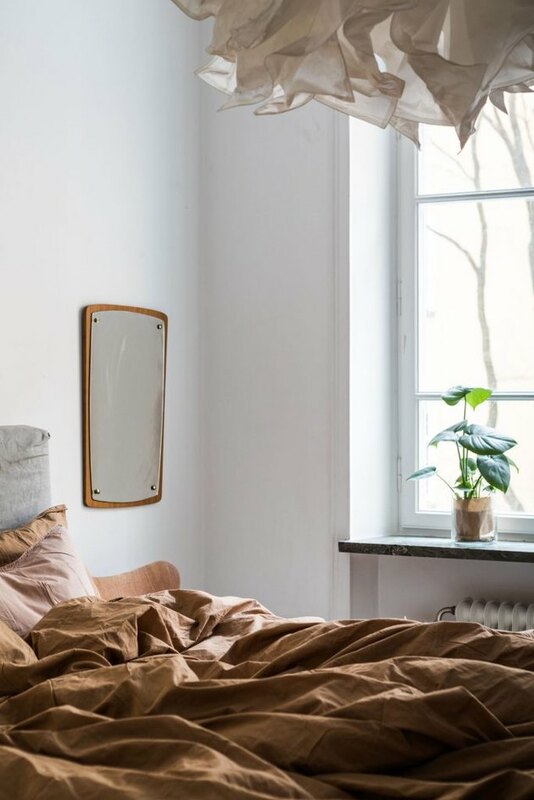 Blogger Fanny Ekstrand warmed things up in her Scandi-chic sleeping quarters with the help of pale pink and rust-colored linens. 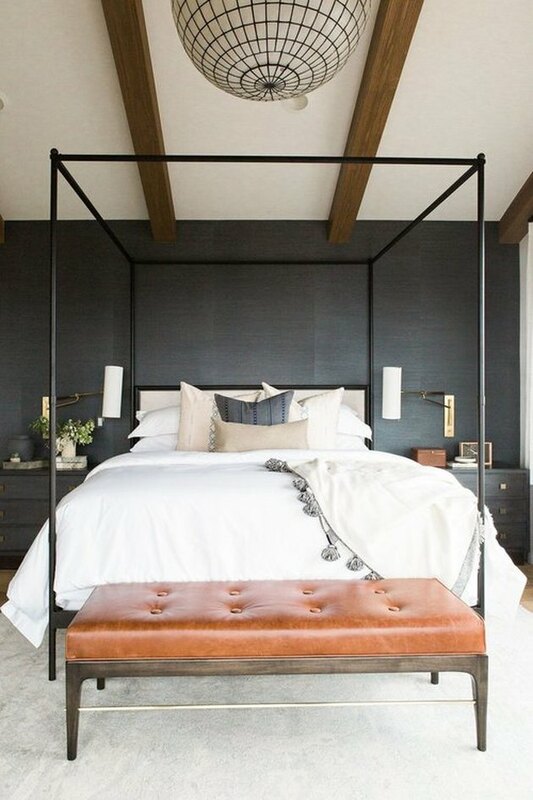 The white walls and light gray headboard balance out the space just enough to keep the orange hue from overwhelming. 9. Surround your bed with ethereal curtains. 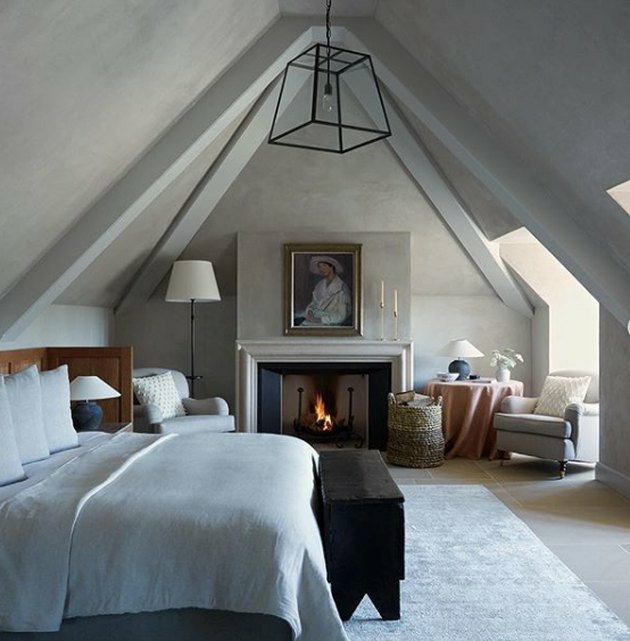 The dramatic floor-to-ceiling drapery framing the bed in this gray bedroom, designed by Emma Fischer from Emma Hos, adds oodles of height and drama. The woven rug, blankets, and pendant light add visual warmth and texture to the space, while the green plants provide a welcome pop of color. 10. Make the most of a small space. We love small spaces for their inherently cozy feeling. 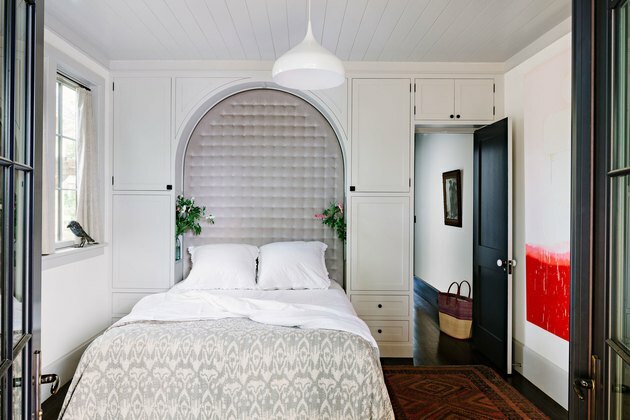 Portland-based designer extraordinaire, Jessica Helgerson, maximizes limited space in this petite bedroom by creating an arched headboard out of utilitarian and attractive built-in cabinets. The tufted velvet material is the perfect soothing backdrop to lay your head, and an ikat bedspread and Turkish rug add warmth and color. It's hard, no, impossible, for us to resist a bedroom with a fireplace. This beauty is located outside London in Heckfield Place, an 18th-century Georgian estate that was thoughtfully restored as a hotel by Ben Thompson. 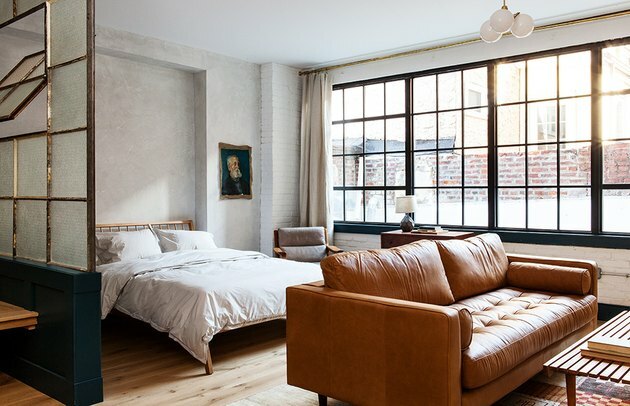 He perfectly evokes that old world charm with limewashed walls, curated furniture, period artwork, and a bed full of pillows — this is a cozy bedroom idea we would never tire of.